For a sophisticated colour palette in the kitchen you can't beat the perennial classic of blue and white. 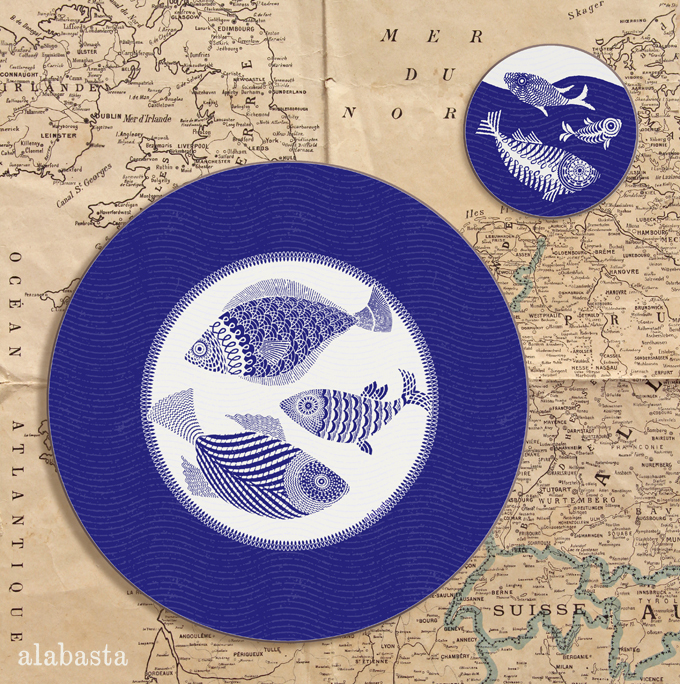 After lots of careful design tweaks, the Blue Fish placemat and coaster are now available to order. There is a 28cm round mat with three happy fish swimming in a sea of ultramarine blue waves - when you put your plate on top all you'll see is the subtly patterned border so it's quite good for mixing with blue and white china. There's also a cute 10cm coaster that shows one of the fish jauntily coming up for air. They are in a clearer brighter blue than the Blue Fish trays - it's more ultramarine than navy and goes rather well with the bone china ceramics that we are working on. They aren't quite ready to show yet but I'll show them here first, so keep a look out! All mats and coasters are available to order from Avenida Home.